Binaural interference: Are two ears always better than one? The short answer is almost always yes when hearing is normal in both ears. However, when one ear is affected by an ear or hearing condition, it may not be as staright forward. 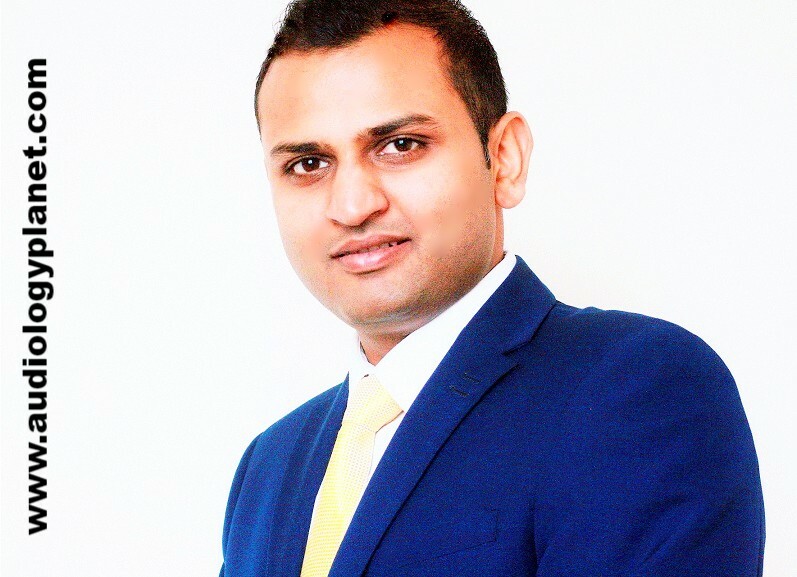 Consequently, audiologists have to be consicous of ear conditions that may imply that giving their clients one hearing device is sometime better than two. The common reasons why an audiologists will choose for one device are discharging ear or other middle ear issue on one side, acoustic neuroma, unilateral auditory neuropathy, asymmetrical hearing loss with suspected dead regions in one ear; and/or a phenomenon know as binaural interference. 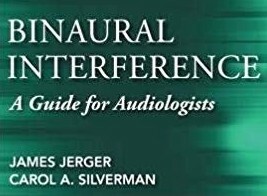 Binaural interference refers to the phenomenon in which the potency of binaural cues conveyed by a “target” stimulus occupying one spectral region is degraded by the presence of an “interferer” stimulus occupying a spectral region remote from the target. Jerger and Silverman (2018) have illustrated this handsomely in their very latest book with subjective and objective findings (correlates involving late auditory potenials and cortical evoked responses). The knowledge of it, however, has been in the literrature for at least about 80 years now when Knudsen (co founder JASA) first referred to it in his seminar paper ‘An ear to the future’ in 1939. There has been considerable research in last 40 years or so. The first level testing tecnique is to measure Quick SIN scores via soundfield (with speech and noise spatially separated rather than headphone testing) in monoaural (by plugging the non-test ear) and binaural conditions along with administration of speech spatial qualities questionnaire. Any suspicions of binaural interference should be referred for further testing for dichotic listening assessment and objective electrophysiological testing, where indicated. Furthermore, field trials (Cox, 2012) have indicated that up to 46% of the subjects preferred to use one hearing device rather than two and contrary to conventional wisdom, audiogram and auditory lifestyle may not be predictive of aiding preference for up to a third of clinical population. Therefore, clinicians are encouraged to think holistically about thier hearing care pathways that work for each individual rather than a group. Rhythmic objective tinnitus may be present due to glomus tumours, vascular anomalies such as vascular loop, or palatal myoclonus associated with central pathology: brainstem or cerebellar vascular, infectious, demyelinating disease, tumours, trauma, iatrogenic surgical complications or aneurysms, or middle ear myoclonus. Myoclonus refers to the rhythmic jerky contraction of a muscle or group of muscles e.g. Hiccups are also a form of myoclonus. Middle Ear Myoclonus (MEM) is a rare form of objective tinnitus can occur in the two smallest muscles in the body behind the eardrum and in front of the cochlea namely, tensor tympani and stapedius. Tensor tympani myoclonus makes noises like thumping of a drum or clicking. It is generally faster than pulse and could be as much as 90-100 times per minute. Most of the times the vibrations are visible on the eardrum. Stapedius muscle myoclonus can usually be heard as high frequency tic, crackling, or buzzing noise in the ear; and is usually audible to examiner. Stapedius muscle spasms may be recorded during reflex decay test using a tympanometer in the form of bumps on the trace. Lastly, irritability of the 8th nerve can cause an intermittent tinnitus representing itself as a staccato quality (‘like a typewriter in the background, pop-corn or Morse code’), known as typewriter tinnitus. Pharmacological treatment of the middle ear myoclonus does not have convincing evidence. However, typewriter tinnitus is responsive to carbamazepine. Botox injections in the middle ear have been reported to help in some cases. Surgery is tried as a last resort where the middle ear muscles are divided. Tinnitus retraining, sound enrichment, cognitive behavioural therapy, and mindfulness training are useful. Earn up to 12.5 CPD points from BSHAA, 12.5 CPD points from Audiology Australia (endorsement number CPD1819 007, category 1.1), and BAA CPD endorsementFANTASTIC NEWS: THANKS TO OUR GENEROUS SPONSORS, WE ARE OFFERING FIVE SEATS AT A MASSIVE 10% DISCOUNT TO PASS ON THE SAVINGS TO OUR DELEGATES. ALSO, TWO PLACES FOR STUDENTS WILL BE AVAILABLE AT A MINIMAL FEE OF £50 FROM 15.10.2018 ONWARDS. CONTACT TODAY TO BOOK YOUR SPACE. DO YOU THRIVE ON EXCELLENCE IN HEARING CARE? 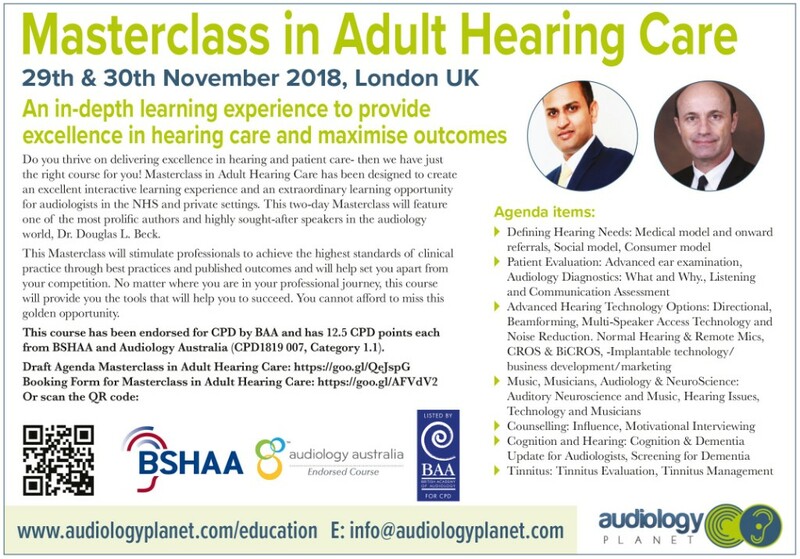 This in-depth and detailed course has been designed to create an excellent interactive learning experience and an extraordinary learning opportunity for audiologists in the NHS and private settings.This two-day Masterclass will feature one of the most prolific authors and highly sought-after speakers in the audiology world, Dr. Douglas L. Beck. This course will address theory, practical and scientific principles of each topic. The content will be focused towards delivering excellence in hearing healthcare and providing the best quality audiology service to the patients we serve. This Masterclass will stimulate professionals to achieve the highest standards of clinical practice through best practices and published outcomes and will help set you apart from your competition. No matter where you are in your professional journey, this course will provide you the tools that will help you to succeed. You cannot afford to miss this golden opportunity. If you would like to contribute to this complimentry newsletter with your own stories, book review or review of earcare/audiology evidence, please get in touch. We are always looking for authors who have a flare for writing! CAN YOU GUESS THE ABOVE EAR CONDITION? 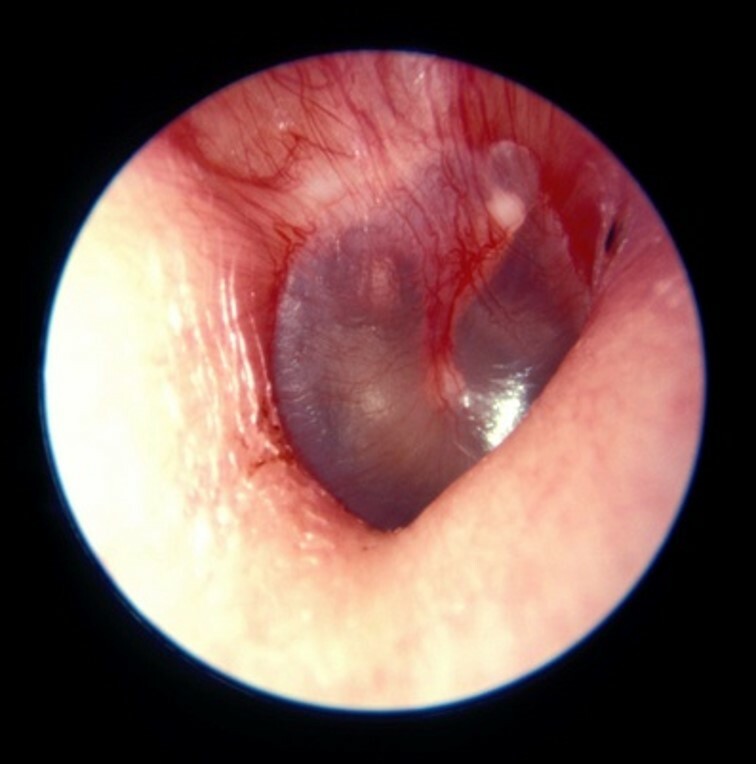 This is a picture of perfectly normal ear drum. Hang on a second, what is all that redness about? The vessels of the deep external canal and tympanic membrane may undergo a reflex vasodilatation when the canal or tympanic membrane are stimulated e.g. during ear irrigation, caloric testing, or even in a crying child. This vasodilatation, however, should not be confused with the vasodilatation seen as a result of infection i.e. during an acute otitis media. And much more professional content , industry news, and coverage of some events avaialble on the social channels ..Subscribe today by clicking on your favourite channel/s above.